The Kardashians are starting to splinter, which is good news for us – it means that the reign of the Kardashians is slowly [but excruciatingly] coming to an end. Khloe Kardashian posted a host of Instagram photos from her Thanksgiving dinner, but we’re hearing that two very notable guests were missing decided to avoid the event: Kim Kardashian and Kanye West. Kim and Kanye reportedly spent the holiday in Paris, but the fact that they would miss spending the big day with their family? Hmmm, I’m thinking there’s trouble in [fake] paradise. Um, we get it. 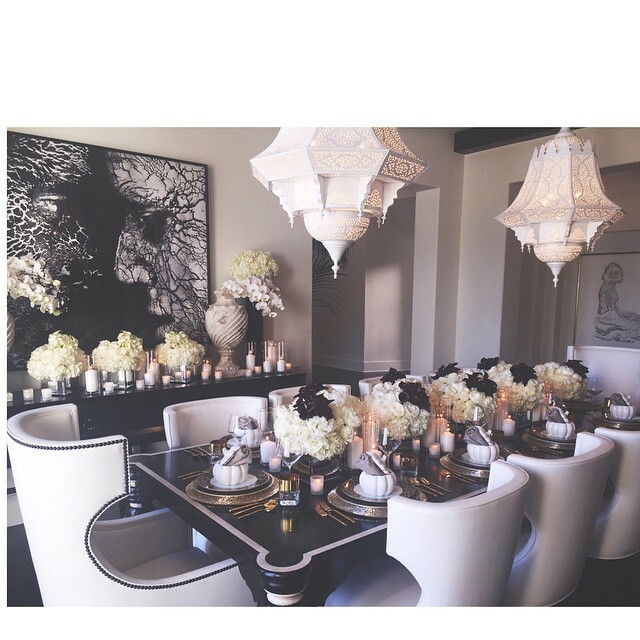 You guys are so BLESSED to have such a GORGEOUS table [wtf] and you are all so PROUD of the WONDERFUL Khloe Kardashian because [zomg] she COOKED a THANKSGIVING meal. It’s a miracle, y’all. Forget Jesus coming from the dead after three days. Khloe Kardashian making thanksgiving dinner is the new miracle. Seriously, these people are so full of crap. Sure Kris, use exclamations and all CAPITALS to distract from your two most famous guests, when they’re too busy avoiding you and your ridiculously fame-whorey family every chance they get. We already know that Kanye West hates that entire family, but it looks like he’s slowly starting to convince his wife to cut ties with them as well. It’s certainly going to make future family reunions a bit awkward….